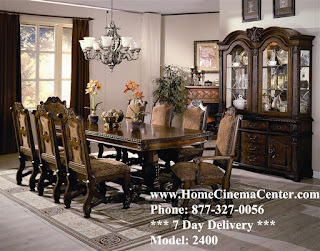 Home For the Holidays Sale - Order now for delivery by Thanksgiving! This set includes a Queen Sleigh Bed ( Queen Sleigh Footboard, Queen Sleigh Headboard, Sleigh Rails), 8 Drawer Double Dresser, Landscape Mirror, and one Night Stand. 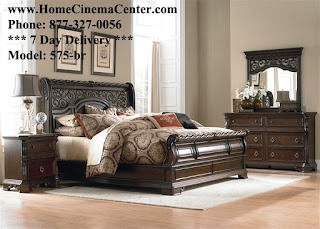 You might optionally upgrade the bed to King Size, add 6 Drawer Chest, Media Chest, and another nightstand. The Neo Renaissance Collection by Crown Mark is fashioned after early European manner house decor from the high back upholstered seating to the beautifully crafted carvings on table base and chairs you'll find unmatched richest. The Dylan Collection by Parker House offers updated contemporary style with modern feel. Individually pocketed coil seating in each cushion with 1.6 - 1.8 density foam is giving superior, soft seating. 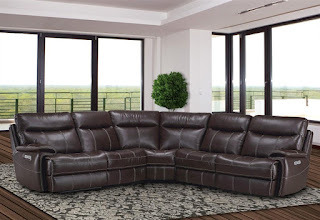 This collection is available in two colors; mahogany and creme Motion High Performance Fabric providing you with stylish and quality seating options for your enjoyment and relaxation.